The Charleville Lodge is a beautiful elegant hotel and is ideally located close to Dublin City. One of many Dublin hotels, you are sure to enjoy this unique boutique hotel. 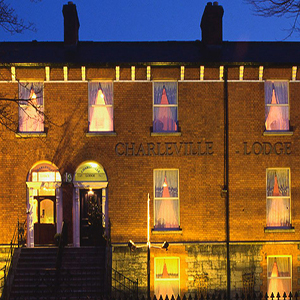 The 3 star Charleville Lodge Hotel is a beautiful Victorian terrace of houses and boutique accommodation located in the Phibsborough area of Dublin 7 Ireland. The hotel is near to many historical sights, theatres, shops and restaurants. The place comprises 3 victorian houses (main house) and a contemporary wing to the rear (garden wing). The rooms in the main house overlook Dublin's iconic, tree-lined North Circular Road, while those to the rear have a view of the courtyard. With their high ceilings and Victorian decor, the bedrooms are full of character and charm. The bedrooms feature traditional furnishings, as well as free WiFi, flat-screen TVs and en suite bathrooms with showers. The Charleville Lodge hotel boasts White Moose Café which is an urban, bistro-style restaurant serving reasonably-priced Irish food with a contemporary twist. The place is open from 7:30am to 3pm Tuesday to Friday and from 9:30am - 5pm Saturday and Sunday, breafast, lunch, dinner and brunch are served in this beautiful café. The elegant guest lounge with an ornate fireplace is a licensed bar at this Victorian building, it is a relaxing place to watch the television, read the newspaper or chat with friends over a cup of coffee. McGowan's of Phibsborough is in walking distance and you will enjoy live DJ performance in a fantastic nightclub. 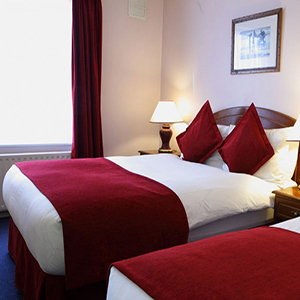 3 star Charleville Lodge Hotel is ideally located in Dublin city centre with close proximity within city's major music venues such as 3Arena, Bord Gáis Theatre, Gate Theatre, Abbey Theatre, Olympia Theatre and many more. If you are attending to watch and support your beloved team in action,thishotel is an ideal place to stay as Dublin's major sporting venues such as Croke Park is in a short walking distance and the Aviva Stadium is just a few minutes drive from the hotel. The hotel offers two meeting rooms that can cater for up to 35 people, which is ideal for small meetings, seminars and boardroom meetings. The meeting rooms boast modern business facilities and good natural light. Both meeting rooms offer complimentary WIFI access & optional catering services for business customers.